This device is aptly named because of its six pre-set heat settings, which allows for steeping teas at the right temperature—starting at 160F to 200F for delicate teas and French press coffee, respectively. It is equipped with blue LED indicator lights, “start” and “keep warm” buttons, 360-degree base, removable scale filter, and stay-cool handle. Cuisinart is more popularly associated with the food processor that goes by the same name, but it is actually a brand for small kitchen appliances. Carl Sontheimer founded it in 1971. When the company went bankrupt in 1989, it was owned and became a subsidiary of Conair Corporation. Today, aside from the food processor, it manufactures other products, including these Cuisinart Teapots & Tea Kettles. 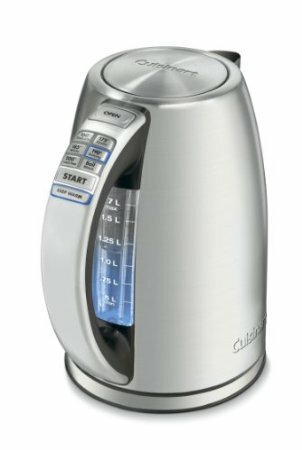 If you are on the lookout for a kettle that lets you make the perfect cup of tea and a bowl of instant oatmeal all in one nifty device, choose one from Cuisinart. Whether you are looking to buy an electric kettle or a teapot, whether you want to compare various brands or even when you want to see which model from one specific manufacturer is the best, the TheTeaSupply.com reviews will get you to the most viable conclusions. Check out all the tea product reviews from the TheTeaSupply.com!